The 6205 utilizes EdgeTech’s next generation bathymetric technology to provide an enhanced and fully integrated, swath bathymetry and dual frequency side scan sonar system. The 6205, a Multi Phase Echo Sounder (MPES) produces real-time, high resolution, three dimensional (3D) maps of the seafloor while providing co-registered simultaneous dual frequency side scan imagery. The 6205 uses ten receive element transducers and one discrete transmit element. The high number of channels enables superior rejection of multipath effects, reverberation and acoustic noise commonly encountered in the shallow water survey environment. 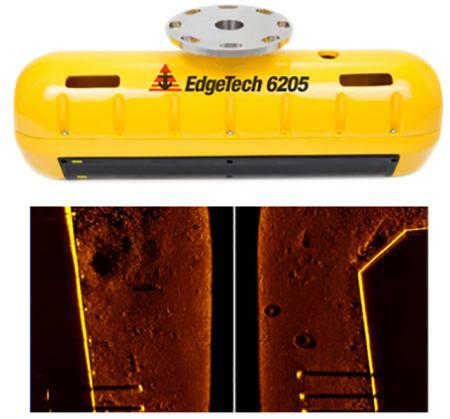 Utilizing EdgeTech’s Full Spectrum® technology, the 6205 exceeds IHO SP-44, NOAA and USACE specifications for feature detection and bathymetric point data uncertainty. Near shore and shallow water hydrographic surveys are completed faster and safer utilizing the 6205 due to the wide swath (over 200º view angle), which is typically more than three times that of existing sonars that rely solely on beam forming techniques. The 6205 utilizes EdgeTech’s latest electronics and arrays resulting in an extremely lightweight, modular design required for shallow water applications and vessels of opportunity. The standard configuration for the 6205 includes an integrated sound velocity sensor and interfaces with standard GPS, MRU, SVP, CTD, Altimeters and Gyros. The 6205 interfaces to most 3rd party acquisition and processing software as well.